In a natural enviroment and fresh air we invite you to relax over your meal on our outside terrace with herb-garden or around our huge fireplace. 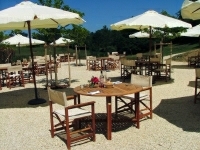 The restaurant is open in the evening from Tuesday evening till Saturday evening 19h15 / 20h15. Closed on Sunday and Monday. Only on reservation 24 hours in advance.